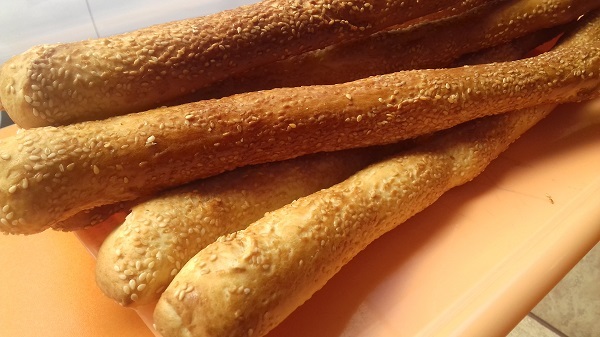 This one is an amazing recipe for keto breadsticks with sesame seeds. These breadsticks have only 1 g net carbs per serving. Place the grated mozzarella and cream cheese into a bowl and microwave on high for 1 minute. The mixture has to be nice and smooth. Add almond flour, salt, and mix until well combined. If the dough is too sticky add 1 tablespoon almond flour. Place the dough on the piece of parchment paper and flatten with your hands until ½ inch thick. For easier results, you can use a roller pin. If your dough still a bit sticky use parchment paper on the top. Cut into 12 strips and form them into breadsticks. Place breadsticks on the baking tray with parchment paper or baking mat on it. Brush each stick with melted butter and sprinkle with sesame seeds. Bake in the oven at 400 F (200 C) for 10-15 minutes or until golden brown. Remove from the oven and brush with leftover butter.